The Church of England's governing general synod is due to vote on whether to allow women to become bishops. A plan paving the way for consecrations from 2014 is expected to be backed by bishops and clergy, but the vote among lay members could be much closer. Twenty years after the introduction of women priests, the issue continues to split traditionalists and liberals. Ahead of the vote, synod members will debate the latest compromise proposal for parishes opposed to the changes. The vote is being seen as the first major test for the next Archbishop of Canterbury, the Right Reverend Justin Welby. The current bishop of Durham is expected to speak during the debate and urge the synod to support the introduction of women bishops. Approval is also supported by the outgoing Archbishop of Canterbury, the Most Reverend Rowan Williams, who has warned of turmoil in the Church if the change is voted down. Simon Barrow, co-director of the Christian think tank Ekklesia, said the Church would only look foolish if it rejected the move at this opportunity. "So it's only a question really of when it will happen. If it doesn't happen now the Church is going to look desperately embarrassed." Women now make up about a third of all clergy in the Church of England. It is nearly 20 years since the first women priests were ordained in the Church of England. Many thought it was only a matter of time before opposition faded away and women bishops would naturally follow. But the theological divisions between liberals and conservative evangelicals and Anglo-Catholics are as deep as ever, and these last two groupings, both against women bishops, are growing in numbers and influence. Their concerns centre round the measure's "Code of Practice" which, they say, isn't strong enough to guarantee they will always be able to avoid a woman bishop in the chain of command in their parishes. If the measure does get passed, then women bishops could be consecrated by 2014. 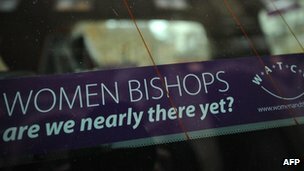 If not, it will be back to the drawing board and there will be no new legislation on women bishops for about five years. But lay member Emma Forward said that a vote in favour of women bishops would "go against the Church and the future of the Church". "We're looking for really constructive ways to work forwards, and this legislation that we have in front of us doesn't offer that. And that's why a 'no' vote is essential," she said. A three-day meeting of the synod began at Church House in Westminster on Monday. Approval requires two-thirds majorities in each of the synod's three houses: bishops, clergy and laity. If the measure is approved, the legislation will go to Parliament before receiving royal assent. However, if it is defeated, the legislative process will need to start again and another vote would not take place before 2019. The current process of formulating legislation to introduce women bishops began in 2000. The arrangements for instances when a female bishop is appointed but traditionalist parishes reject her authority have proved a stumbling block to its approval. Under the plans, a woman bishop would delegate to a stand-in male bishop. But a vote was adjourned in July after supporters of women bishops objected to a concession they felt went too far. A new amendment before the synod says the male bishop should be selected in a manner that "respects" the reasons the parish asked for him in the first place. Some Anglo-Catholics and conservative evangelicals continue to reject a deal, and a coalition of traditionalists, evangelicals and Catholics within the Church have sent a booklet to all 468 members of the synod arguing the draft measure falls short of what they need. In a letter to the Times newspaper on Friday, signed by 327 clergy from all but one of the Church's 44 dioceses, they said backing for the draft measure would "lead irrevocably to deep fractures appearing within the Church". Meanwhile, more than 1,000 Church members, including bishops, clergy and senior laity, have signed an open letter - published in the Independent newspaper - urging the synod to vote in favour.